Pakistan made a decent start to their innings, with Azhar smashing six boundaries in his 50-run knock. But right after reaching the milestone, Azhar lost his concentration and in order to hit a six, the right-handed batsman gave away a catch to Hardik Pandya, while trying to sweep the ball. Subsequently, Pakistan also lost opener Ahmed Shehzad and Babar Azam cheaply for 12 and 8 runs respectively, before Mohammad Hafeez provided the side with some resistance by his 33-run knock. However, it seemed that Pakistan were making their way back to the game when veteran batsman Shoaib Malik came to the field and struck two boundaries and one six in quick intervals. But he too failed as he got run out cheaply for 15 runs. Pakistan were eventually bundled out for 164 for 9. Earlier, put in to bat first, openers Rohit Sharma (91) and Shikhar Dhawan (68) provided their side with a perfect start as not only did they blast half-centuries each, but also went on to stitch a huge 136-run stand, thus making them the most successful opening pair in the history of the eight-team marquee event. It was also the pair's highest partnership, beating their previous best record of 127 runs against South Africa in Cardiff in June 2013. While it was Rohit's 30th fifty and fifth half-century against Pakistan, Dhawan notched up his 18th fifty and second against the arch-rivals. 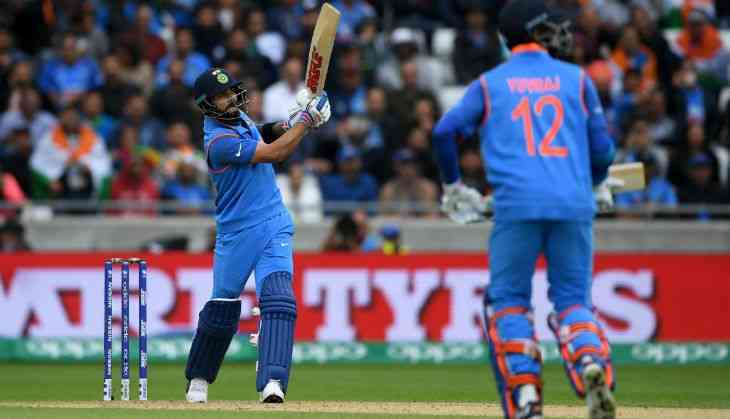 While Yuvraj was hitting freely, Kohli slowly gained in momentum and hammered his 40th fifty off 58 balls and his first against Pakistan. In the 46th over, things went even worst for the Sarfraz Ahmed-led side when the Indian skipper smashed two boundaries and a six and Yuvraj scored his 52nd fifty off 29 balls and 12th against Pakistan. The duo added 93 runs for the third wicket. Yuvraj was declared 'Man of the Match' for his brilliant batting performance.